Yugi is the main character and the hero of Yu-Gi-Oh! He was given the Millennium Puzzle by his grandfather, Surogoku Muto. Yugi then proceeded to solve and complete the Millennium Puzzle, thus accessing the hidden powers that waited in it. Within the puzzle, Yugi gained a hidden spirit, an ancient spirit that comes out whenever Yugi plays a game. This is what is known in the Yu-Gi-Oh! 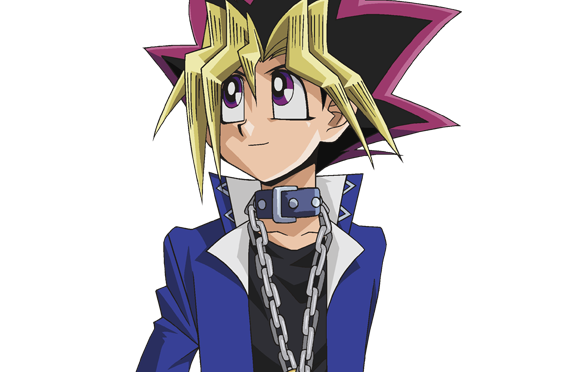 Series as Yami Yugi, or “Dark Yugi” in English. Yami Yugi is the only “good natured” spirit of the Millennium items and continually helps Yugi through all the tribulations set before him. Starting with the Duelist Kingdom Story Arc, Pegasus J. Crawford, the creator of Duel Monsters, found out about Yami Yugi defeating the uncontested champion, Seto Kaiba. Pegasus knew Yugi had some kind of Millennium item, and in his quest to bring together all seven items, he lured Yugi into a major tournament held on an island named Duelist Kingdom. Pegasus lured Yugi, by first trapping him into a Shadow Game, in which Yugi lost due to the duel having a time limit. Since Yugi lost the “Shadow Game”, Pegasus inflicted a “game penalty” to Yugi, thus stealing Surogoku’s soul. This was the “bait” Pegasus needed to lure Yugi, as well as Bakura to the Duelist Kingdom, because Ryou Bakura was after Yugi’s Millennium Puzzle as well. With Yami Yugi taking over when the duels started, Yugi passed through most of his obstacles in the Duelist Kingdom, beating several challenging opponents. While doing this, he played with honor and skill, unfortunately, most of his opponents did not. He faced devastating opponents such as the sea duelist, Ryouta Kajiki (English name: Mako Tsunami), Insector Haga (English name: Weevil Underwood), Player Killer (English name: Panik), Mei and Kyuu (English names: Para and Dox, the Paradox brothers), and Seto Kaiba, right before Pegasus’ castle, where Kaiba unleashed one of Yu-Gi-Oh!’s most perilous and powerful monsters, the Blue Eyes Ultimate Dragon. Once Yugi got in the castle and was named one of the Duelist Kingdom finalists along with Bandit Keith Howard (Nickname and Eng. name: Bandit Keith), Mai Kujaku (English name: Mai Valentine), and Katsuya Jounouchi (English name: Joey). He faced Mai in the Duelist Kingdom semi-finals and won, unveiling his counter to the Blue Eyes White Dragon, the Black Luster Soldier, also known as the Chaos Soldier. In the finals, he faced a surprising Jounouchi, where they had an extremely impressive duel. Jounouchi waited for Yami Yugi to play Demon Summon (English: Summoned Skull), and with a quick combo, fused Summoned Skull with his own Red Eyes Black Dragon, creating Black Demon’s Dragon (English: Black Skull Dragon). Yami Yugi got past this ordeal though, taking advantage when Jounouchi used his Time Magician’s effect to turn Baby Dragon into Thousand Dragon. Unfortunately, for Jounouchi, he didn’t know it would also turn Yugi’s Black Magician (English: Dark Magician) into Black-Robed Sage. Yugi eventually beat Jounouchi, let Jounouchi take the claim to the prize money so he could help his sister, and Yugi went on to duel Pegasus. Yugi and Pegasus laid high stakes on the line. Pegasus said he would free Seto Kaiba, Mokuba Kaiba, and Surogoku Mutou if Yugi won, but said Yugi would become entrapped and would lose the Millennium puzzle if he lost. After seeing and surviving Toon World and the Thousand Eyes Sacrifice, Yugi finished off Pegasus with the Magician of Black Chaos (Likely English Name: Magician of Dark Chaos). Yugi later went on to help Kaiba fight the “Big 5” (the people who tried to take over Kaiba Corp) and encounter Otogi in the Dungeon Dice Monsters. Currently, Yugi is participating in the Battle City tournament and wields the god card, Osiris, as well as Jounouchi’s Red Eyes Black Dragon (see the situation in later updates, and in Jounouchi’s bio, how he lost Red Eyes). Yugi’s Duelist Kingdom deck, or rather, Surogoku’s deck has a Black Magician Theme, with support from a ritual theme. Surogoku’s deck is very ingenious at first, but when Yugi loses Exodia, and gives Jounouchi his Time Magician, it strictly becomes a basic Black Magician Deck supported by ritual monsters. Yami Yugi, being the great duelist that he is, constructed a new deck for the Battle City Story Arc, and so far, it has worked to satisfaction, leading Yugi far into the tournament finals. While it still centers on the Black Magician, Yugi has added a few counters to his new deck to the Blue Eyes White Dragon, such as the Buster Bladder, and when Jounouchi refused to take his Red Eyes back when Yugi won it back from a Rare Hunter, Yugi kept it in his deck. So now, with Red Eyes and Demon Summon both in his deck, he can fuse them into Black Demon’s Dragon (Eng. name: Black Skull Dragon).